I’m sitting cross-legged on the sand in the cool of the early morning. I can see the outline and the white cliffs of Nusa Penida island in the distance, through the fading pink sky of dawn which is slowly transforming itself into the bright blue of a sunny day. 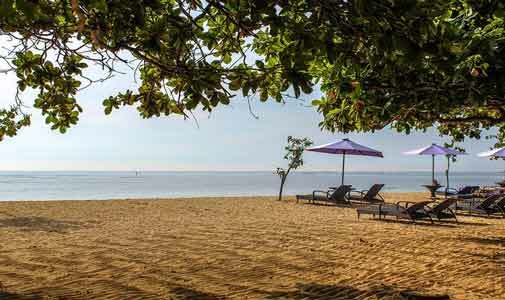 I’m on Sanur beach, a place which touches the soul. The gentle sea breezes are fanning my face which is already warm from the short cycle ride down to the beach. Around me are a friendly group of locals, expats and tourists, all sitting cross-legged like me, soaking in the peace and beauty of the scene. We’re waiting for our free yoga class to begin. This happens every morning here. Life on the beach goes on around us, a couple of street dogs come and go and occasionally bark, but mostly just settle down amongst us on our mats. I don’t understand most of what the teacher says once he gets started, but no matter. I just copy what everyone else is doing. Certain words pop out from the Indonesian instructions, such as ‘relax’ and ‘surrender’. I work out that the word ‘gunung’ seems to mean ‘downward dog’. And ‘plank’ means ‘plank’! Everyone is welcome and we’re all united in the common goal of relaxing and stretching and enjoying the moment. At the end of the class I have a chat with Lindsay, an expat who’s been living in Bali for over 10 years. She has three children and works for an aid agency. I asked her what drew her to Bali. “The people are wonderful, friendly and tolerant,” she says. “And of course, the cost of living is a big factor for many, although with school fees being my biggest expense, living here probably works out the same as it would for me living in Australia. But it depends how and where you live. If you rent a house in an area where locals live, you can pay as little as $2,000 a year, but if you want to be near the beach in a big, smart villa, you could pay as much as that a month on a short-term lease. Sanur’s five-kilometre, scenic, paved walkway makes strolling or cycling along the beach a breeze and you’ll be spoiled for choice when it comes to restaurants and bars to pop into for a bite to eat or a refreshing drink for just a few dollars. 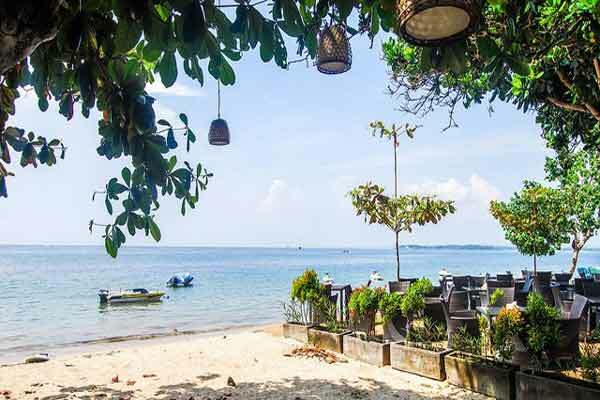 It’s more upmarket these days than when I first discovered it—you’ll have no trouble finding fine dining restaurants and ritzy resorts—and the expat community is thriving, but happily Sanur has still managed to retain its quiet, small town feel. Another expat, Ildiko, joins in the conversation. I met her the first time I did this class. She’s living in a homestay at the moment, but says she is going to try and get a villa once she’s sold her apartment back home. The great thing about test-driving retirement on Bali is having the opportunity to chat to expats already settled here and get the inside information ready for when I make the move—and classes like this one are an easy and fun way to meet them. Is it Safe to Live in Bali?